Never in my gaming career did I ever think I’d actually play an onscreen colonoscopy, let alone have fun doing it. But that’s one of the many surprisingly enjoyable medical skills you’ll experience in Trauma Team. As anyone who’s familiar with the series can attest, this crevice camera work is not par for the course. The traditional barrage of high-pressure surgeries has been tossed in with more relaxed options from multiple specialties this time around. Instead of taking the role of a lone surgeon, you play as six different doctors. Traditionalists will feel right at home with the straight surgery career, but I found it a little easy and brief in comparison to previous Trauma games. However, just when it started to feel like I’ve been there and done that, the paramedic track kicks in. This doesn’t let you dig into patients, but the doctor Diner Dash gameplay that keeps you jumping around among five injured people ups the tension in a fun and unique way. Orthopedics and endoscopy stay true to the Trauma vibe, yet add their own twists. 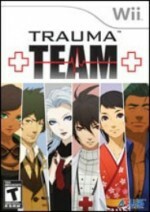 The final two careers, diagnosis and forensics, are sure to be the most polarizing elements of Trauma Team. Anyone who’s played Ace Attorney will recognize plenty here – analyzing witness and patient statements, surveying a crime scene, building strong evidence, and more. The cases and diagnosis mysteries were intriguing to unravel, but the brisk clip of other modes slows to a crawl as you take on these longform chapters. After I’d completed all of the diagnosis missions and was a ways into forensics, it felt so removed from the rest of the game that I had to actively remind myself that I was playing a Trauma Center title and that surgery would eventually return in the end. Perhaps the better option would have been to limit the adventuring to one character so that pacing doesn’t take as much of a hit. Players can jump around between doctors at any time, so maybe that’s the way to approach it rather than plowing through the careers one at a time like I did. Two-player local co-op takes on many different forms depending on the career, ranging from simultaneous (surgery) to turn-based (orthopedics) to nonexistent (forensics). If you decide to skip co-op, you’re not missing out on anything, but it’s an amusing diversion if there’s another Trauma fan in the house. I never thought I’d play an onscreen colonoscopy, let alone have fun doing it.